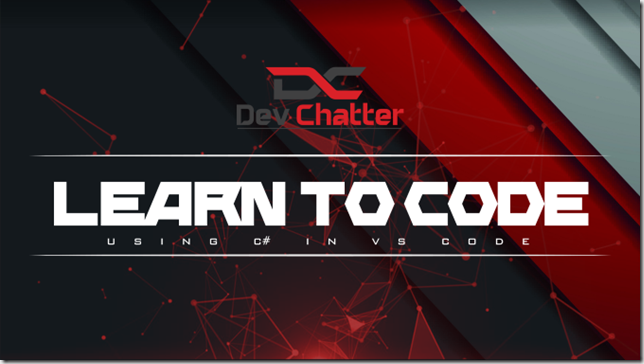 Starting this Saturday, we’ll be doing a new series of streams on DevChatter. If you’re new to programming, new to C#, or just want to go back to basics on C#, this stream is for you! On our channel, we’re normally doing either long-term projects or programming exercises, but we want to get some great educational C# content as well. To that end, we’ll be teaching people how to program using C# on a regular basis. If that’s something interests you, you can find our Learn to Code in C# series on Twitch. From that page you can ask Twitch to remind you of our Learn to Code in C# series. Also, make sure to follow DevChatter on Twitch to get notifications when we go live. From VS Code, install the C# Extension in VS Code. These are all light-weight tools that will allow you to get started writing real-world applications, but none of these are difficult to get started with or install. I hope you’re all as excited as I am for the start of this series of streams! Yesterday, I was working with my dev team, and some people came across some C# 7 code. Specifically, they were seeing some code using Pattern Matching, and weren’t sure about it. Not everyone was familiar with C# 7, a failing on my part. 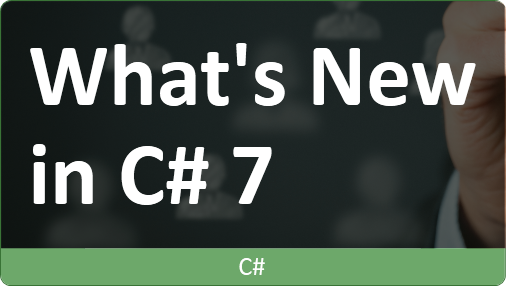 If you’re also not familiar with all of the new features in C# 7, I’d recommend checking out my What’s New in C# 7 course on DevIQ. In the course, I go through all of the new features of C# 7, explaining both how they work and when to use them. I talk regularly at conferences about C#, and have given talks on C# 6, C# 7, and the combination of the two. When I ask people if they’re using a version of C#, most people acknowledge they are, but when I ask about specific features, most hands drop. I find that many developers are not using the features made available to them until long after it’s available to them. Don’t miss out on these! As C# grows it’s important to stay up-to-date on everything that it offers you! Check out my course today and get your quick-start to using the new features in C# 7! And many developers need to know about C# 6 still. I did a course covering C# 6 as well, so you can check out the bundle I set up. 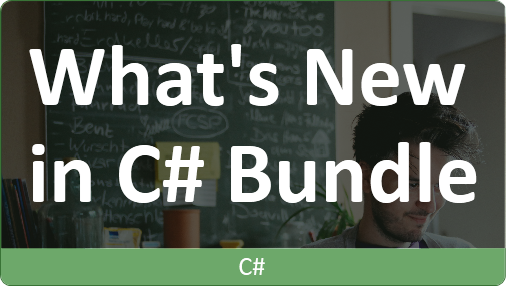 The What’s New in C# Bundle includes both What’s New in C# 6 and What’s New in C# 7! Allowing you to learn everything you need to know to bring your C# project up-to-date! If you’re looking to improve your C# 6 code by taking advantage of the new features added into the language, I’ve got you covered. 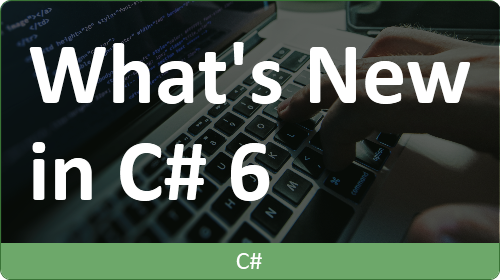 By using C# 6, you’ll be able to clean up your code, and make things more concise. This was one of the focuses in the design of C# 6. You can clean up and remove the clutter from your projects by taking advantage of C# 6. My C# 6 course on DevIQ will show you how to use these new features to improve the code you’re writing today. You already have the tools and capability, and now you can learn how to take advantage of it! As a consultant, I’ve worked with developers in different companies, and I find that most organizations are barely using the features of C# 5 let alone using C# 6. When I talk at conferences, most people say they’re using C# 6, and they technically are using it. Their code is compiled using C# 6, but they’re not using all of the features or know how powerful they can be! To help teams with this, I created a quick-start, What’s New in C# 6 course on DevIQ that will help you get started using C# 6! So as a bit of fun, since I just wrote a post about duck typing and foreach loops, I thought I would take a look at what’s happening under the hood when we use this trick. To start with, I will have two classes, which each have GetEnumerator methods. The first one is using DuckTyping, so it doesn’t implement any interfaces. The second one is implementing the IEnumerable interface. Finally, I have a third class with a method that just uses a foreach loop over instances of the other two classes. After I compile this code, I’ve opened it up with IL DASM, so I can see what the generated IL is for this code. Yes, it’s a bit ugly, but you will notice that other than naming, the code is just repeated twice. This is of course what we would expect, since the code should treat it the same regardless. All the foreach loop needed was to be able to get the object from the GetEnumerator method. Once it has that, it just uses the enumerator to do all of the work. This means that either class should work just as well. This is the repeated line of code that shows up in two places to get the enumerator it will be using for its MoveNext() and GetCurrent() methods. Now if you’re really paying attention, you will have looked at the Try-Finally block that is in the code to handle our IDisposables. That’s another neat thing happening behind the scenes, but that’s another blog post entirely. If you would like to see another cool thing in the .NET Framework, you should check out what else you can do with Null Instance methods if you change those callvirts. During my Software Craftsmanship Precompiler session, I heard one of the students say, “all you need is an IEnumerable to use a foreach loop”. This sparked a bit of fun when I asked Steve Smith, my co-presenter, if that was correct. He confirmed that it was, and I disagreed. Being the scientists that we are, we decided to try it and see what happened. I of course knew that duck typing in C# should allow the Foreach loop to compile without anything having the method required by the IEnumerable interface. This means that we just need a GetEnumerator method. We wrote the code that did this and it compiled! Duck typing is awesome, because it allows the language to treat my type the way I want it to because it has the right tools to do the job. The term duck typing comes from the idea that if it looks like a duck, swims like a duck, and quacks like a duck, then it probably is a duck. In the foreach loop example, duck typing assumes that what you have here is able to be enumerated, because it has a method to get the enumerator. If we look at the IEnumerable interface, we can see that this is what we are required to implement. Now that we have our collection written and implementing IEnumerable, we can write a foreach loop that uses our collection. Finally, because of the duck typing in C#, we can remove the interface from the code, but keep the method. One of the many cool things about C# that I love. It’s a fun language, so go experimenting! After reading the title of this post, some people might be wondering why I am advocating commenting at all, because I’ve spoken out against commenting code before. My team and I were recently reading through some code that was littered with comments, and I do mean littered. There were tons, they were mostly useless statements like “//run”, and I swear there were more of them than actual code. This of course sparked some preaching to our choir about how comments in code are often less-than-useful. We of course settled on the time when they are useful being the XML comments on methods, but those should also only be used when writing public libraries where others will not have access to the source code or unit tests. Comments on those methods are useful since tons of people will use the method and will not be able to see the guts of the method or examples of how to use it. This makes the comments useful. However, they need to be kept up-to-date (difficult task). So what does all of this have to do with Listkov Substitution? Well, the principle basically says that all of the classes which implement an interface (or inherit) need to work the same way. There should be no difference between implementations as far as the calling code is concerned. In fact it is really about making sure that we maintain a consistent abstraction. If we say something about the interface it must hold true for the implementation. This means that any comments about the interface must hold true for every implementation. We were wondering if the comments needed to be on each of the concrete classes or if we could just put it on the interface, and this was confirmed for me by Ben Heimann who quickly made an interface and a concrete class. Then he commented just the interface method and not the concrete one. We of course knew we would see the comment when using the interface, but we also saw it when we were dealing with the concrete class. Great work Visual Studio 2010! This means we don’t have to duplicate and also signals that we should follow LSP. The concern is that if you have the comment in both places you would have to update them both. This also means that they could differ, and if they ever needed to intentionally differ then it means that we are violating LSP. Having the comment in the one place should at least point to the fact that we should maintain the same behavior for the calling code in all implementations of our interfaces. Interfaces and base classes allow us a great deal of power in object oriented programming. We are able to accept a base type or interface and be given an implementation or an inheritor and continue working correctly. What if, however, we need to be able to accept more than one type, which have the same methods or properties, but to not share an interface or base class? Often the best answer is to add a common interface to these, so that the shared behavior is defined. In most of my cases when I need to do something like this, it is because I don’t have the source code for one or more of the classes. Our answer in this case is the dynamic types which we added in to C# 4.0. In this new revision of the language, we are able to declare an object deferring its type until runtime. We will define how we will use the object now, and at runtime our code will attempt to use that object. Reference types were created to make dealing with pointers a little bit easier. They hide away the details of the pointers, so that the programmer need not think about them. In many ways I think they’re awesome, because they really achieve that goal. The problem is that by abstracting away the details of the pointers they’re sometimes difficult to work with, because they can be a little bit confusing. I received a comment about this topic on one of my ASP Alliance articles explaining value types and reference types in C#. First of all the article is excellent. as it's areference type only one copy is shared between references. How about if we take this step by step looking at the variables and their values, and I’ll be able to explain why the behavior is as you’ve found. First here is the code we’ll be looking at. We are expecting it to print out “Brendan:Enrick”. Red is for the variables and orange is for referenced values for those variables. Notice that when we set a variable equal to a literal string value we get a new location in memory, but when we set it equal to another variable all we are doing is copying the pointer to that memory location. However, when we then set that variable equal to a new literal value it doesn’t replace the old one for both since they each had a pointer. It just creates a new location in memory with that value and assigns a pointer to that variable. The type of behavior that the writer of this code was trying to achieve could be handled by pointers very easily, but reference types take away control of pointers. Loss of freedom for the sake of safety one might say. Now that I’ve said that everyone will switch back to using c++ to get their pointers back. Thank you for asking the questions saurabh. I hope this thoroughly answers your question. If you have any more, please feel free to ask them as well. Expanding on an article I wrote a couple of years ago where I explained interfaces in C#, I’d like to explain why people should use interfaces. I received an email from a reader of my ASP Alliance article. He understands how interfaces work, but he’s trying to see why so many people are raving wildly about their greatness. His questioning of them is great, because it really is not obvious why interfaces are useful. Anyone who says otherwise is just trying to brag. A couple of years ago, you wrote an article for ASP Alliance called "Understanding Interfaces." Once again, I saw how the code works, once again, I failed to see how it will benefit me. Here's where everything breaks down for me: You create an interface with just method, property and event signatures. Then you inherit them in a class, recreate these same signatures and write the code to implement these methods and properties. So I’ll start by mentioning that nearly all patterns, practices, principles, etc. in software development are based on code reuse. One of the most important reasons for code reuse is change. Developers are always responding to and creating changes. We must mitigate the risks of change, identify where changes will occur, and we must make changes. Right about now you might be thinking, “but interfaces don’t reuse code. They just force you to implement new code. Using inheritance would be the way to achieve code reuse.” You ate technically correct. You understand how interfaces work, but you’re not seeing why we use interfaces. Interfaces themselves do not give us code reuse at all, however, they enable us to achieve code reuse. Remember that I said that we must identify where changes will occur. Making this identification allows us to isolate changes thus mitigating the risks of changes and allowing us to make changes. Isolating the places that change also allow us the reuse the code which does not change, so by keeping some parts separate we can reuse others. The interfaces are for the places we can’t reuse the code. Interfaces are “places of change”. Each implementation of the interface is a variation on how that required piece of the puzzle could have been implemented. This is contrary to how you’ll see a lot of interfaces used. It is sometimes difficult to see this as the behavior of interfaces, because people overuse interfaces. As I see it, I could have saved a whole lot of time by not creating the interface in the first place! I mean, it's not doing any work. I still have to create the signatures in the class. Why on Earth do people praise these things and call them the answer to multiple inheritence? They don't do anything! It is mostly true that interfaces don’t do anything. As far as being executable code is concerned an interface is basically just a worthless extra step, so why would we use them? Declaring an interface is like saying, “there is more than one way that this behavior could be implemented, but interactions with this behavior should be done this way only.” Having that common “interface” allows us to use any of these implementations interchangeably. Some people would recommend that interfaces should be used everywhere. I’ve heard people say that no variable should be declared with a concrete type if it can be avoided. That may be a valid point, but if you’re just learning how interfaces can be useful that is a bad approach. If you don’t see value in interfaces, you will certainly not see the value of them when people use them everywhere. This washes them out and obfuscates their purpose. Interfaces are used for logic which will have multiple or changing implementations. This means that we should use them in places where we will out of necessity have duplicate logic. Using the interface is what allows us to do this. Take a look at this code for composing a letter. Notice how we have these flow control operators dictating how the code will execute. What will happen if we need to have a third option for greetings and signatures for family members? We might add another else-if or we might use a switch. Either way this code gets larger and changed every time. However, if we identify the aspects of the code that are changing we can isolate them and mitigate the risks of changing the code by keeping separate the logic which has multiple implementations. Notice we have already used one form of encapsulation by keeping each of those pieces of logic in separate methods. The logic we haven’t encapsulated is the flow control. We can create an interface for it. The best name I’ve got for now is IFormalityGenerator, which is not a great name, but it will do for now. I’ll create that interface with two methods: GetGreeting and GetSignature. Very simple interface. Now we can rewrite our method to look like this. We now just make the decision sooner and only once which implementation we are using. If this is a formal letter we will use the FormalFormalityGenerator. If it is casual we will use the CasualFormalityGenerator. Down the road when we create one for family members we can just go and create an implementation for the FamilyFormalityGenerator. We’ve made it so we create new code each time instead of going and changing the existing code in this method. The power of an interface is in its ability to encapsulate the volatile aspects of a program and isolate that which can be reused more easily.